SAN ANTONIO - A San Antonio elementary school principal has become an overnight celebrity after she was captured on camera serving breakfast to hundreds of her students. Mead Elementary School Principal Annette Lopez was notified Wednesday that the cafeteria was going to be short-staffed causing breakfast time to go from three lines to only one. Lopez said several of the school's cafeteria employees were on sick leave. With the campus having the highest number of students in Northside Independent School District that are served breakfast, Lopez grabbed a hair net, gloves and an apron and reported for cafeteria duty. "When you serve that many students, there is no way that one line is just going to do it," Lopez told KSAT.com. "I loved it and the kids had fun, (and) one of the kids said, ‘Hey, I know you,’ and I said, “Yes, I’m the principal." Lopez said the campus has about 750 students enrolled at Mead and serves meals to over 400 of them each day. 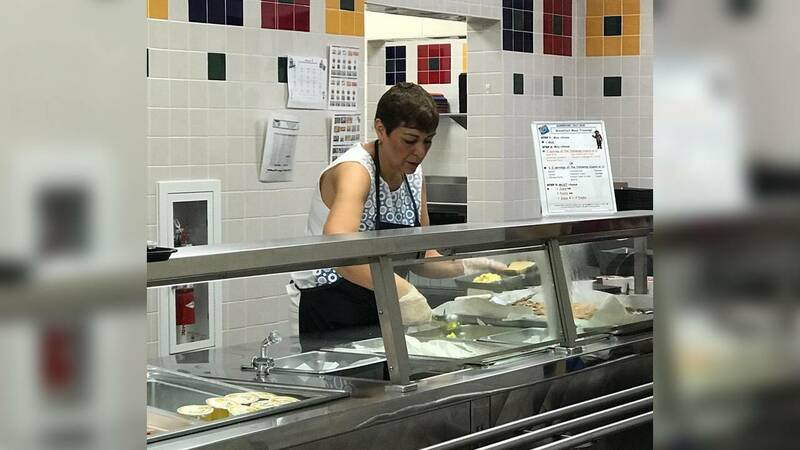 A photo capturing Lopez serving breakfast was shared Thursday on the school’s Twitter page, and since being shared, the tweet has gained nearly 300 likes in less than 24 hours. The heartwarming act was beloved by many on social media and many of Mead's teachers and students. "The kids loved it. They were like, 'Ms. Lopez, I didn’t know you were a cafeteria lady, too.' And so I kept telling them, 'You know, principals do whatever it takes,'" Lopez said. "It got around to the teachers, and that’s when they started taking pictures." Lopez told KSAT.com she hopes her action will also serve as an example for her students. "They (students) kept saying, 'But, you’re the principal.' And I kept saying, 'It doesn’t matter what your job title is, if someone needs help, then you do it,'" Lopez told KSAT.com. Lopez told KSAT.com that Wednesday’s cafeteria shift was the first one she’s had in her 14 years as a principal. She said even though the cafeteria was fully staffed by lunchtime, she was prepared and ready to step up once more. While she’s happy to receive the spotlight, Lopez said it’s her staff at Mead Elementary School that deserve credit for supporting their students everyday.